The spring edition of the NY Bike Jumble swap meet, the largest bicycle flea market in NYC, is coming again to the Old Stone House in Park Slope on Saturday 5/14/2016. Here is your chance to get a great deal on bicycles, accessories and clothing. Here is your chance to get a great deal on bicycles, accessories and clothing. 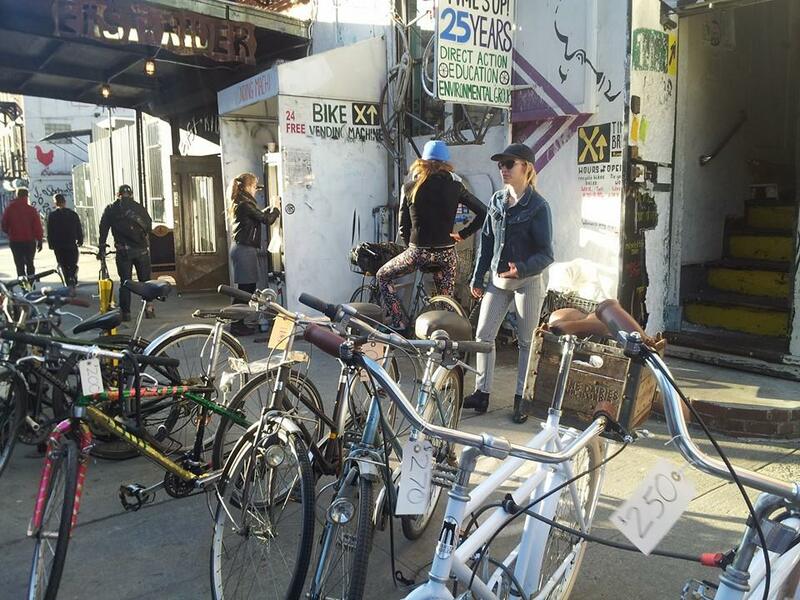 This Saturday at the Old Stone House in Park Slope is the annual spring swap meet known as the NY Bike Jumble. Looking for a cheap bike for the upcoming warm weather season? Here is the latest events calendar from your fine environmental educators and activists. Join us for a leisurely, peaceful ride to some of downtown Manhattan’s peace sites, including: Tibet House, Anthroposophical Society, Former residence of John Lennon and Yoko Ono, Point Thank You, Teardrop Park, The Irish Hunger Memorial, Art from the Berlin Wall, Robert Wagner Park, The Labyrinth for Contemplation, Fritz Koenig’s “The Sphere,” St. Paul’s Chapel, the site of the Mother AME Zion Church (“first church in NYC built and led by Afro-Americans”) and the African Burial Ground. Great ride for kids and cyclists new to group rides. Route subject to change, not all sites are visited on every ride. DRESS FOR THE WEATHER! Heavy rain or snow cancels. A Peace Bike Ride (co-sponsored by Times-Up!) going to LES community gardens and ending at MoRUS where the “Cycle of Peace” photography exhibit will be on display. The photo exhibit will include photos that speak to the theme “Cycle of Peace” by 25 New York based photographers. Critical Mass is a spontaneous celebration of what our streets could look like. This fun group ride encourages new cyclists and creates safer streets and new green infrastructure. Strap some music to your bike and make sure to bring the appropriate lights and bells. Join us on bicycles or skates at 10 p.m. on the last Saturday of every month at the Columbus Circle (59th Street) entrance to Central Park for a totally safe, magical, evening ride in Manhattan. As with our Moonlight Rides, we’ll share the tranquillity of Central Park, plus we’ll add the grand vistas of the Hudson River from Riverside Park. The scenic tour continues down the greenway to the lovely pier where bicycles are welcome. After that, it’s a pleasant ride through streets back to Columbus Circle. This ride usually covers about 10-12 miles and lasts about 2 hours. Weather? We only cancel when no one in their right mind would have fun. Dress for the weather. We hope these rides encourage folks to enjoy our parks at night, without motor vehicles: quiet, safe, and relaxed. The City Reliquary Proudly Presents -the- 10th annual Bicycle Fetish Day 2014 Saturday, June 21st Noon til 6PM Havemeyer between Grand Ave. and Hope St. Williamsburg Brooklyn. Spring Has Sprung-Events from Time’s Up. It’s time to come out of hibernation and join the fun and exciting world of Time’s Up. 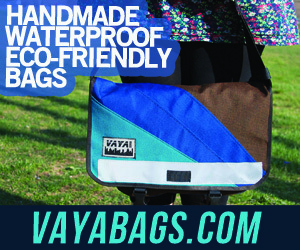 The weather is getting better and there’s lots of great ways to spread the Velo Love like blossoming flowers. Time’s Up is kicking things off with a great event. Time to wash off this brutal winters grime and dirt you’ve been building up like a badge of honor on your ride. Free pop-up bicycle workshop in the back yard of the Diamond Bar, with Beer. Tools, bike stands, a washing station (w/ parts-washing station) and a couple of bike mechanics will be there. Show your weather-worn bike some love. Celebrate April Fools and oncoming warmer bike weather with a night of weird and humorous short bike films. Gripping, first-person footage of Alleycat races from around the world. From the helmet camera mastery of rider/film maker Lucas Brunelle. Time’s Up! is a 20-year-old nonprofit, grassroots environmental organization working to make New York City- and the world- a healthier and more sustainable place to live. All of our events and campaigns are free and open to the public- educational and fun bike rides, bike repair workshops, movie nights and presentations, community garden workdays and outreach, bike and public space advocacy and more. Continue reading Spring Has Sprung-Events from Time’s Up.